Mindy Starns Clark writes Amish non-mystery books and has written at least one Lancaster County mystery. Can you think of any Amish, Quaker, or Shaker themed Cozies to add to the list? Let me know in the comments below! Another Quaker mystery series is/was by author Irene Allen; first three books have good reviews and readers enjoyed learning about the Quaker way of life; fourth in series apparently seems panned by fans of the series, as it is more an indictment against government and less of a mystery and less about established characters. I have the first 3 books. Dates are from my copies of the books; amazon concurs with order of books as I’ve listed. 4 – Quaker Indictment (also referred to as Quaker Sojurn (possibly the original, pre-publication title). TXRed, thank you. I’m going to go add them to the list right this minute. I think that some of Mindy Starns Clark and Nancy Mehl’s books would fit into the Amish/Mennonite category too. Mary, I am only aware of one mystery by Nancy Mehl that falls into this category. Does she have a series of Amish/Mennonite Cozies? Nancy Mehl has The Harmony trilogy, Road to Kingdom trilogy, and Road to Kingdom trilogy. Maybe they are really more suspense and a little heavier than the cozy mystery category. Take a look and see what you think. Mary, thank you. I just added both the Harmony trilogy and the Road to Kingdom trilogy. I called Guideposts today and found out that the Secrets of Mary’s Bookshop ended with “Mixed Motives”. I enjoyed this series and am sad it has ended. Time to find another one. Interesting. I didn’t realize there were so many. I believe that one of Susan Wittig Albert ‘s China Bayle novels involves a Shaker community. I Forget the title, though. Marion, thank you for reminding us about Susan Wittig Albert’s Wormwood. I have added it to the list. As mentioned Amanda Flower’s Appleseed Creek Amish series is delightful. I immensely enjoy Tace Baker’s (aka Edith Maxwell) series (SPEAKING OF MURDER and BLUFFING IS MURDER) series featuring Quaker linguistics professor, Lauren Rousseau. Readingprincess, thank you! I’ve added Tace Baker’s Quaker mystery series to the list. Danna, thank you on behalf of all who use your useful lists. You are my “go to” spot when I decide I’d like to read more mysteries devoted to certain subjects. TXRed, you’re welcome! I’m glad you find the lists helpful. Does anyone know if there is a Catholic series? I mean besides the Father Brown mysteries. Any Cozies for Catholics? Maybe I’ll have to write one. Wishful thinking. WOW! Thanks. I’ll look into all of them. LynnK, also, this is the Religious Theme Mysteries list. Hot dog! I never realized there are so many. Thanks! One of the best nun series I have read is by sister Carol Ann O’Marie who was a nun. Her books are about a nun that solves murders. Always enjoyable. Love her characters. I think I have read all or most of them. I’d like to add “Plain Murder” and “Plain Killing” by Emma Miller. These have an Amish theme. Laura, thanks for adding Emma Miller’s Amish Mystery Series to the list! I am reading Plain Killing by Emma Miller ( an Amish mystery) and she also wrote Plain Murder. Terrym, thank you. 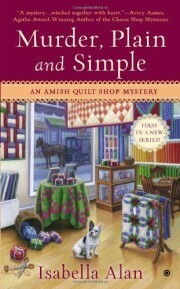 I just added Emma Miller’s Amish Mystery Series to the Amish Cozy Mystery list. Danna – a new entry for your Catholic/nun/Religious Theme Mysteries lists: by author Camille Minichino, who used to be a nun herself/chemistry-physics researcher in real life: a new series of mysteries featuring Sister Francesca, a conservative young nun at the beginning of the post-Vatican II era. Initial book in series is Killer in the Cloister (2014). Camille Minichino is an intelligent author with several satisfying cozy mystery series in different areas of interest Minichino is the author of the Periodic Table Mysteries under her own name, and a series of miniatures/dollhouse mysteries; and under the pen name Ada Madison, she has a mystery series featuring Sophie Knowles, professor of mathematics at a small Midwestern college. TXRed, thanks for all of the Camille Minichino information. She is one of my favorite authors! TXRed, also, Camille Minichino/Margaret Grace/Ada Madison will be assuming one more author persona: Jean Flowers. As Flowers she will write the Post Office Mystery Series, which will debut with: Death Takes Priority. I’m pretty doggone excited! Wow, Danna, thank you, I didn’t know that…Minichino has so many series, and everything I read by her I enjoy. Marja, thank you for telling us about Anne Emery‘s Collins-Burke Mystery Series (book #1 Sign of the Cross). Danna … I don’t know how in the world I forgot Father Burke’s and Monty Collins’ s names! They are standout characters in my reading of the last few years! What can I say … I’ve read a lot of mysteries and am finding the “lumber room” of memory (as the esteemed Sherlock Holmes put it) increasingly full and a bit more challenging to navigate! Thank heaven for sites like yours and the Internet in general! There’s Karen Harper’s Home Valley Amish trilogy- “Fall From Pride”, “Return to Grace”, and “Finding Mercy”, plus a Home Valley Amish Christmas themed stand-alone mystery, “Upon a Winter’s Night”. Hilary, thank you for telling us about Karen Harper’s Home Valley Amish trilogy. I added them to the site as well as to this Amish theme list. More to add to my ever growing list. I may need to start on audio books. I tend to fall asleep to audio books. Good for solitary walks, but if I’m lying down or sitting in a comfy chair the Zzzs come. I find I can’t drive and really listen to a book. I guess my attention is on traffic, so I find I don’t listen that we’ll. If i sit down listening to an audio book I fall asleep soon, too. But i like audiobooks while ironing. This work does works fine with listening. Danna- i just found your website- I love it! But you remind me to go back to my lists of owned and read books, because of the different media and sources (paper book, audio book, ebook, book from friends, the library the e- library, books in german, in english) I sometimes spent valuable freetime in investigating whether I have the book already and if it is the next book in the series or if there is a book of the series to read before..
Judith.k, welcome to the Cozy Mystery site! I am so glad you found us! I guess my obsessive disorder came in handy when I had my Cozies in a bookshelf! I would alphabetize all of the authors and then I would put their books in the correct chronological order. Sometimes I had stacks behind stacks. It was sometimes pretty hectic trying to find a book in a stack behind a stack. “Hex Marks the Spot” by Madelyn Alt (Bk 3 of the ‘Bewitching Mysteries’) also involves the Amish. Susan*, thank you. I just added Hex Marks the Spot to the list. Back in the late 90s, I greatly enjoyed Deborah Woodworth’s Sister Rose Callahan series which was set in a Depression era Shaker community. “A Simple Murder” by Eleanor Kuhns is set in 1795 in a Shaker village in Maine. It is the first in a mystery series with Will Rees, a traveling weaver. The third book in the series, “Cradle to Grave”, is set in 1797 in a Shaker village in New York. The second book in the series”Death of a Dyer” does not have a Shaker setting. tl, thank you so much for telling us about Eleanor Kuhns two mystery books that have Shaker settings. I just added them to this theme’s list. I’m so excited to find your site! Definitely bookmarking it. I’m a writer who just published her first mystery novel, working on the second of the series, and naturally I read a lot of mysteries. I wanted to branch out in my reading more; find new writers, new series, etc., and have a better handle on what’s out there now. Wow, this is a goldmine you have here. Thank you so much for sharing all of this information. I’m diving back in as soon as I submit this comment so I can make myself a nice big juicy list before heading over to the library. Thanks again! 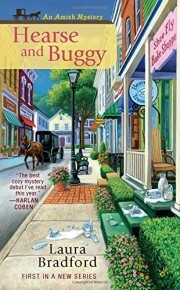 Diane, welcome to the Cozy Mystery site! I hope you find lots of new Cozy Mystery authors you enjoy reading, but that you also save time for writing your next mystery book. Christy, if you’re brand new to the Cozy Mystery scene, I would definitely suggest starting with Agatha Christie‘s Miss Marple Mystery Series. They are “clean reads” and there are usually a few eccentric characters sprinkled throughout them. I think I have another cozy mystery which fits in this category: the Sister Fidelma books of Peter Tremayne. It plays in ancient Ireland 600 a.d. And sister fidelma is not a nun as we know it, because the rules were different. She is kind of nun and kind of advocate. I read the whole series several years ago and I really liked it. I would say its cozy mystery perhaps you like it too? Judith.k, thank you for the Sister Fidelma information. Annie’s Attic has a new series out. Annie’s Amish Inn Mysteries. The first book is Secrets of the Amish Diary. I don’t know what books come after that. Anna, thanks for the Annie’s Attic information! Check your email…I just sent you the flyer showing the first three books in this series. As I said, there will probably be twelve books in the series as that seems to be the magic number for all of the series except the first one and then one that had thirteen books in it. Bev S, thank you for keeping us updated with the Annie’s series. They aren’t easy to find out about unless you’re on their mailing list. Thank you! GREAt list … only had found about half of these!!! Pamela, I’m glad that the list has been helpful!